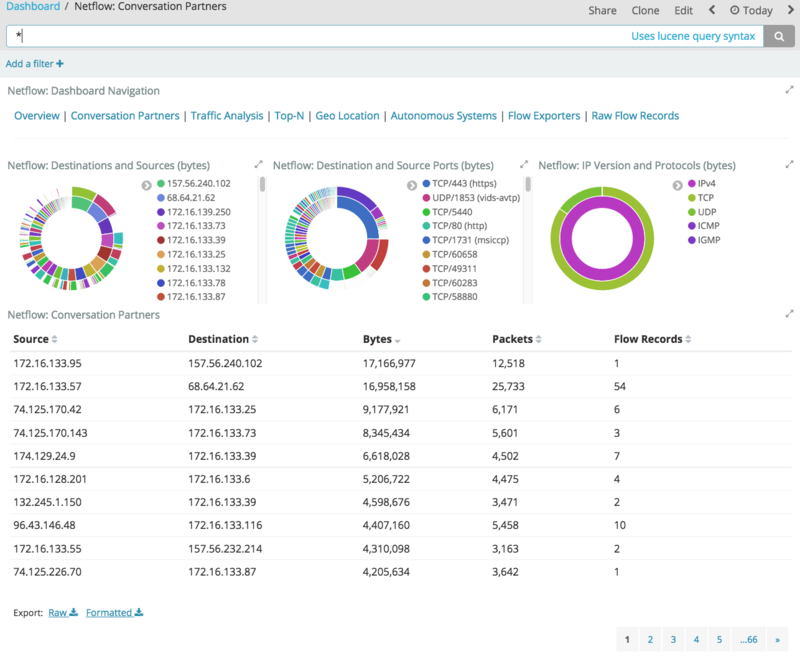 The Logstash Netflow module simplifies the collection, normalization, and visualization of network flow data. With a single command, the module parses network flow data, indexes the events into Elasticsearch, and installs a suite of Kibana dashboards to get you exploring your data immediately. Logstash modules support Netflow Version 5 and 9. Netflow is a type of data record streamed from capable network devices. It contains information about connections traversing the device, and includes source IP addresses and ports, destination IP addresses and ports, types of service, VLANs, and other information that can be encoded into frame and protocol headers. With Netflow data, network operators can go beyond monitoring simply the volume of data crossing their networks. They can understand where the traffic originated, where it is going, and what services or applications it is part of. These instructions assume you have already installed Elastic Stack (Logstash, Elasticsearch, and Kibana) version 5.6 or higher. The products you need are available to download and easy to install. Where NNNN is the UDP port on which Logstash will listen for network traffic data. If you don’t specify a port, Logstash listens on port 2055 by default. The --modules netflow option spins up a Netflow-aware Logstash pipeline for ingestion. 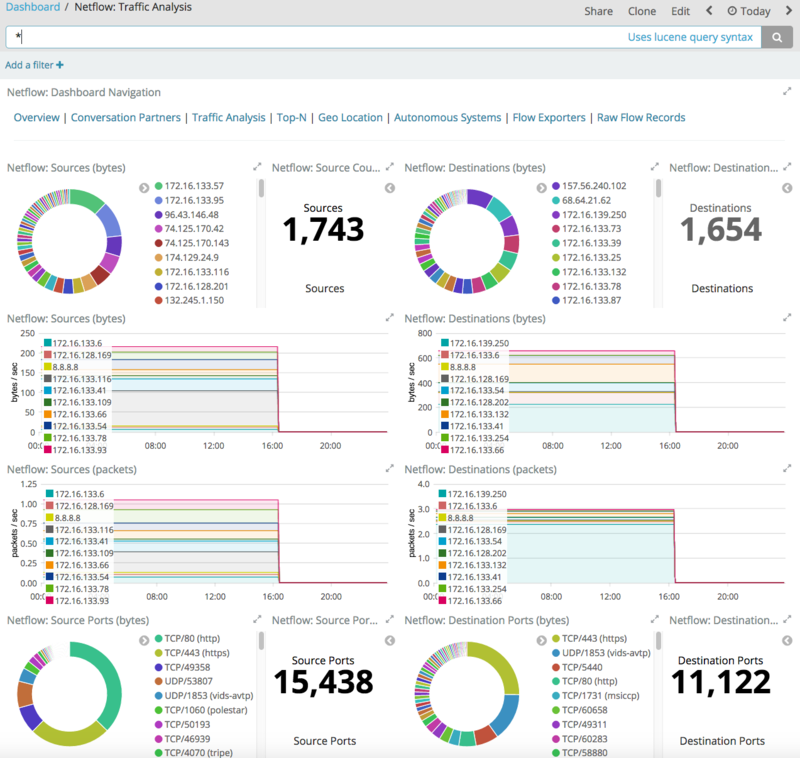 The --setup option creates a netflow-* index pattern in Elasticsearch and imports Kibana dashboards and visualizations. Running --setup is a one-time setup step. Omit this option for subsequent runs of the module to avoid overwriting existing Kibana dashboards. The command shown here assumes that you’re running Elasticsearch and Kibana on your localhost. If you’re not, you need to specify additional connection options. See Configuring the Module. Open your browser and navigate to http://localhost:5601. If security is enabled, you’ll need to specify the Kibana username and password that you used when you set up security. Open Netflow: Network Overview Dashboard. See Exploring Your Data for additional details on data exploration. 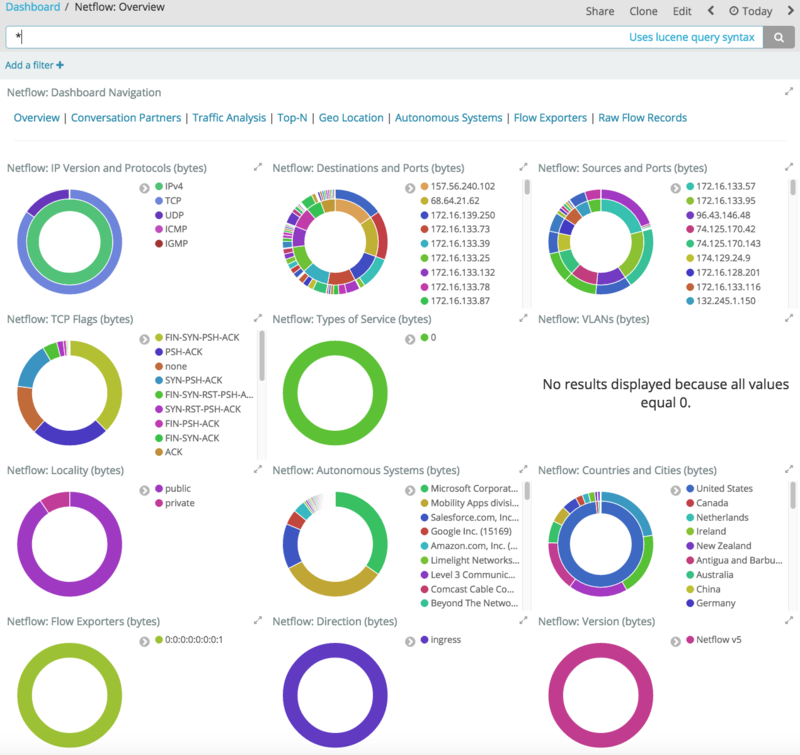 Once the Logstash Netflow module starts processing events, you can immediately begin using the packaged Kibana dashboards to explore and visualize your network flow data. You can use the dashboards as-is, or tailor them to work better with existing use cases and business requirements. On the Overview dashboard, you can see a summary of basic traffic data and set up filters before you drill down to gain deeper insight into the data. For example, on the Conversation Partners dashboard, you can see the source and destination addresses of the client and server in any conversation. On the Traffic Analysis dashboard, you can identify high volume conversations by viewing the traffic volume in bytes. 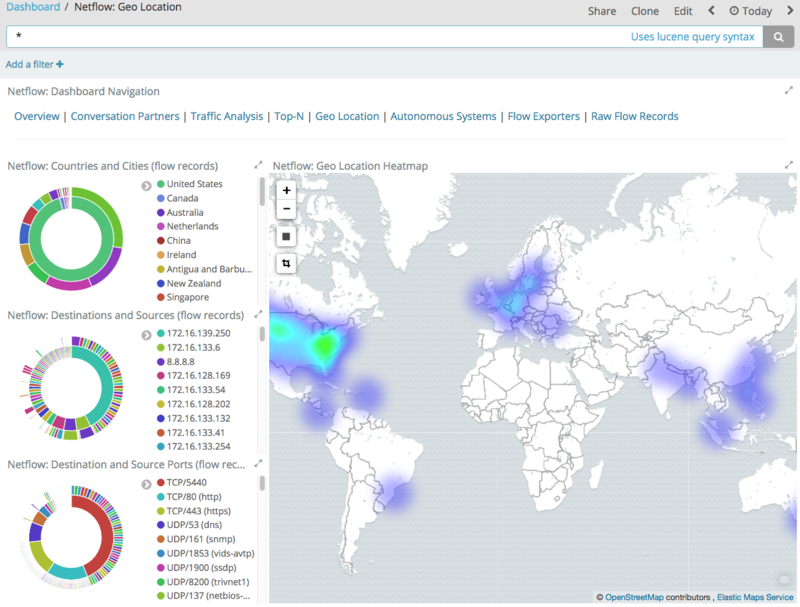 Then you can go to the Geo Location dashboard where you can visualize the location of destinations and sources on a heat map. You can further refine the behavior of the Logstash Netflow module by specifying settings in the logstash.yml settings file, or overriding settings at the command line. For more information about configuring modules, see Working with Logstash Modules. The Netflow module provides the following settings for configuring the behavior of the module. These settings include Netflow-specific options plus common options that are supported by all Logstash modules. When you override a setting at the command line, remember to prefix the setting with the module name, for example, netflow.var.input.udp.port instead of var.input.udp.port. Sets the UDP port on which Logstash listens for network traffic data. Although 2055 is the default for this setting, some devices use ports in the range of 9995 through 9998, with 9996 being the most commonly used alternative. Number of threads processing packets. The socket receive buffer size in bytes. The operating system will use the max allowed value if receive_buffer_bytes is larger than allowed. Consult your operating system documentation if you need to increase this max allowed value.